As BTS’ rising global presence sends its brand value soaring the group is putting out an ever-expanding array of merchandise. At the forefront of the endeavor is Line Friends’ BT21 -- a collection of characters created by BTS members and related merchandise. BT21’s official site says BTS falls in line with the global character brand’s keywords: global, millennials and trending. 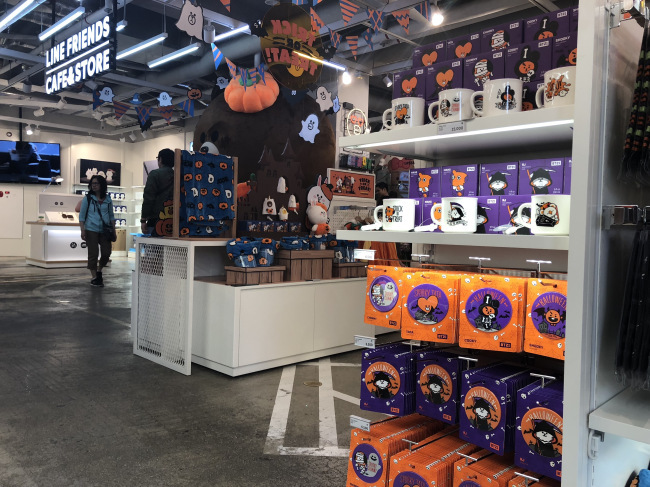 BT21 merchandise attracts more than core fans. Whereas some K-pop character merchandise is modeled after an artist’s appearance, BT21 characters are original creations, knitted together with a fun and unique backstory, designed by BTS members. BT21 has also collaborated with multiple companies, including Paris Baguette and Converse, to expand its scope of products. Sales points are also plentiful. 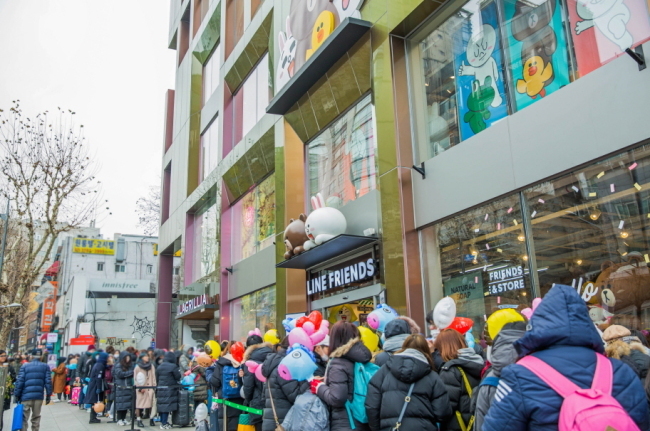 BT21 merchandise is being sold at Line Friends flagship stores in Itaewon, Hongdae, Myeong-dong and other tourist hotspots in Seoul, as well as stores abroad in Japan, Hong Kong and Los Angeles. BTS merchandise also extends to beverages. 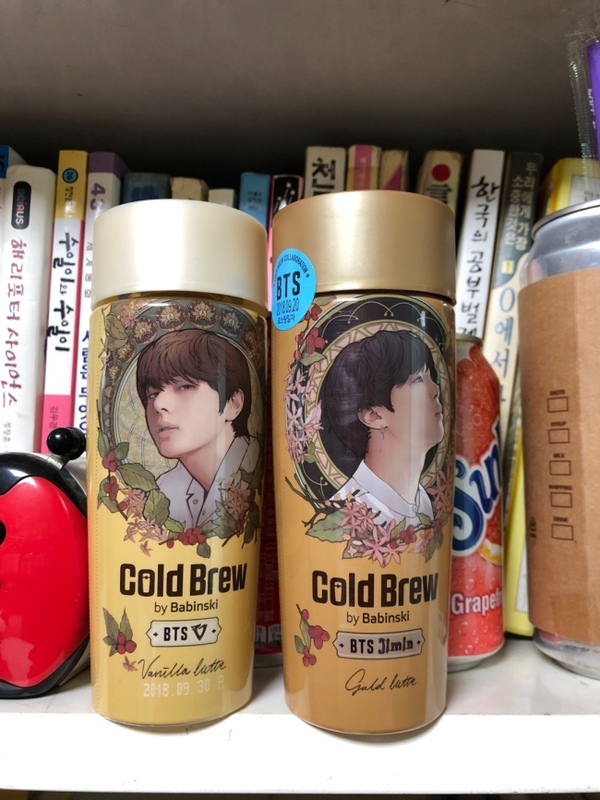 Korea Yakult sells bottled coffee in a special BTS package under the Cold Brew brand. There are seven versions of the coffee bottle, each one with a different member on the side. “As a fan, I have been buying BTS merchandise whenever I came across them,” said Yun So-hyun, a 22-year-old who has been a BTS fan, or ARMY, since last year. Yun has bought two coffee bottles so far, with members Jimin and V on the cover. She claimed that collecting all seven members is extremely difficult, because of fans who buy the products in bulk. Nevertheless, she said that it’s good to have accessible and comparatively low-priced merchandise, especially for teen fans. Korea Yakurt Cold Brew. From the left are BTS members V and Jimin. “Most of BTS’ fans are students who might find it financially burdensome to buy every official BTS merchandise or album,” Yun said. In addition to being on the cover of cold brew coffees, BTS has been global model of soft drink giant Coca-Cola, which has released limited packages of BTS cans and bottles. A college fan who did succeed in collecting all seven members’ bottles revealed that she in fact did not enjoy drinking the beverage. 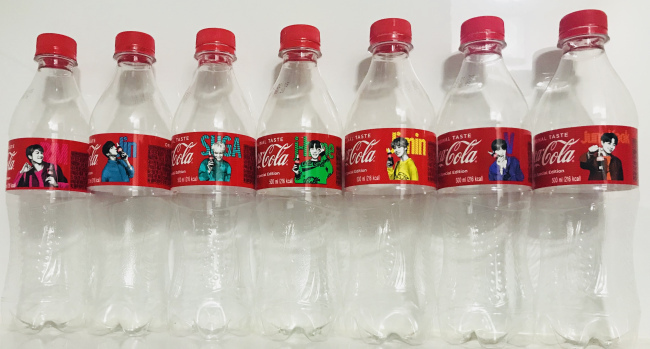 “Though I already knew that this was just another marketing scheme, I happened to see a bottle on display in the convenience store and could not stop myself from buying it,” said Kim Yun-jin, who wished to be referred by her alias. After purchasing the drink, she poured the Coke into a different cup and rinsed the bottle to put it on display. She did this for every Coke bottle she had bought. A raft of big companies are rushing to ride the BTS boom. 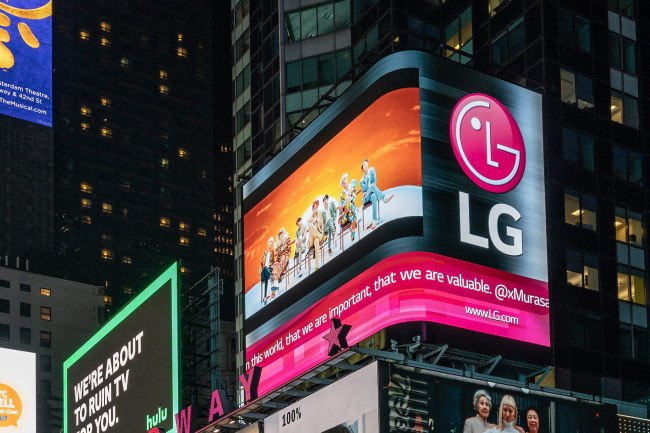 A primary example is LG Electronics, which signed on the group to be its newest model last April. The company promoted its G7 ThinQ smartphone featuring a BTS theme and offered accessory packages for discounted prices. LG Electronics also launched the LG Q7 BTS edition in September, including the group’s logo on the back, a package of handwritten emoji, wallpapers that change every day, good morning and good night calls recorded by BTS members, BTS app and gallery. The company recently beefed up its offline BTS marketing. It generated buzz by airing the group’s videos on a billboard at New York Times Square for 24 hours right after BTS wrapped up its American tour at Citi Field Baseball Park on Oct. 6.